We're sure you already know that green tea has a lot of health benefits. But did you know that it’s also good for the skin? In fact, we're so sold on it’s benefits in skin care that we've included green tea leaves in five of my products. Green tea comes from a tea plant native to Asia called Camellia sinensis. Black tea comes from the same plant. The difference between the two types of tea is the processing. Green tea leaves are picked, quickly steamed or heated to prevent fermentation, then rolled before being heated again. Black tea leaves are picked, allowed to “wither,” rolled, and then left to ferment for some time before being heated again. 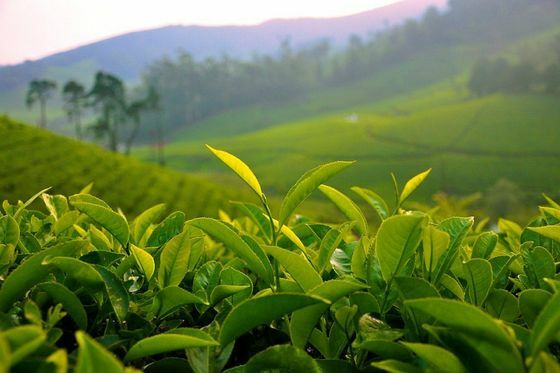 The Camellia sinensis plant also produces white, oolong, and other teas, and is cultivated today in tropical and subtropical regions of the world. An evergreen shrub or small tree, it’s usually trimmed to about 6 ½ feet, and grows yellow-white flowers with 7–8 petals. Green tea's powerful antioxidants, called catechins, protect cells and DNA from free radical damage. Some studies have shown green tea to help reduce the severity of cardiovascular disease, encourage weight loss, lower blood pressure, and help lower LDL “bad” cholesterol levels. Some small studies have also indicated that green tea may help balance blood sugar levels. Drinking green tea is known to help increase mental alertness, most likely because of its caffeine content. Protection: Green tea is antioxidant-rich, which can help you protect your skin from environmental stressors. Anti-aging: Because of the same antioxidants, green tea can help keep skin looking youthful. There is also some evidence that green tea can help firm and tighten your skin's look. Have you used green tea leaves on your skin? What did you think? Photo courtesy amohanial via Flickr.com. “Green Tea,” National Center for Complimentary and Alternative Medicine,” http://nccam.nih.gov/health/greentea. “Green Tea,” The World’s Healthiest Foods, http://www.whfoods.com/genpage.php?tname=foodspice&dbid=146. My mother was the one who spoke to me about the benefits of green tea. She used it to hydrate her skin and I started doing it a couple of months ago and the results are great! This information makes it clear why green tea is so healthy. Thank you for sharing it!